Diabetes is a condition when the pancreas in our body produces very little or no insulin. This is a chronic condition affecting countries worldwide. In India, there are more than 1 million cases of childhood diabetes. The United Kingdom ranks 5th in the world amongst type 1 child diabetes in the world. In the US there is an increasing rate of child diabetes both type 1 and type 2 amongst children and teens. In China over the last few decades, the rate of incidence of type 1 diabetes from the age of 0-19 is alarming. If we check the incidences of child diabetes worldwide we can easily conclude that it is on rising throughout the world. 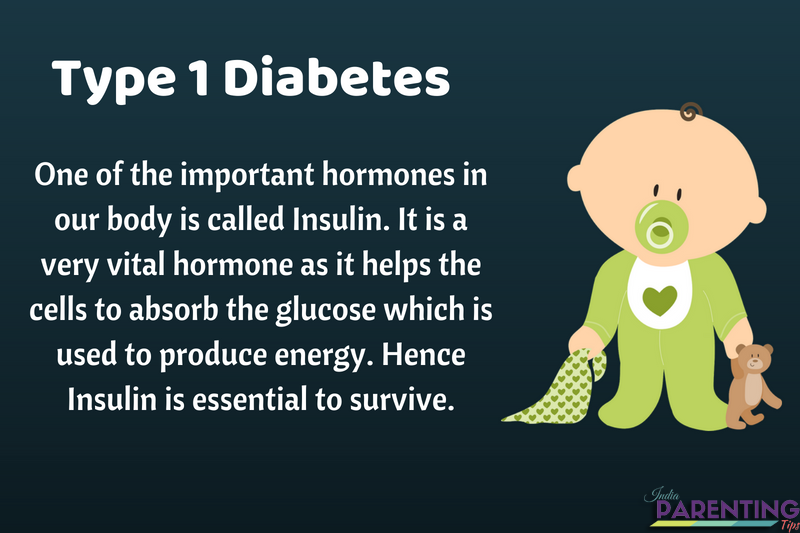 Most common types of Diabetes is Type 1 for children. However, nowadays we hear a lot of cases of type 2 diabetes for children as well. In my article here, I plan to explain parents about child diabetes to create awareness amongst them so that we could take possible steps to fight it out for the sake of our children’s health and well-being. One of the important hormones in our body is called Insulin. It is a very vital hormone as it helps the cells to absorb the glucose which is used to produce energy. Hence Insulin is essential to survive. Type 1 diabetes is a serious condition when the body is no longer capable to produce insulin. In this case, our immune system attacks the pancreas in our body and the cells that produce insulin are destroyed. Can Type 1 Diabetes of my child be prevented? Type 1 diabetes cannot be prevented. Even doctors cannot say who might get it or not. However, according to the opinions of many scientists, it has some strange connection with genes and family history. If any of the parents of the child or someone close in the family blood relations are affected by diabetes, it might also get it. What could be the possible symptoms of type 1 diabetes of a child to identify? The symptoms of type 1 diabetes in a child develops quite alarmingly. Watch out for diabetes symptoms if the child shows some of the symptoms and immediately consult with your doctor. Behavioral changes like getting irritated or angry often. Yeast infection mostly in girl child. Vision problem and unable to keep focus. Breathe smells fruity due to the burning of fat. The exact causes of Type 1 Diabetes are unknown. However, it can be stated that genetics and environments play a key role in this situation. Insulin has a major role to play in breaking the sugar (glucose) from our bloodstream so that the body cells can absorb it. When insulin is not produced in the body the glucose in the bloodstream might cause serious life taking risks for children. Therefore as parents, we need to be extremely careful and alert. Osteoporosis (bone mineral density problems) when adult. There are no known tested ways to prevent type 1 diabetes. Ensuring that the child’s sugar level is maintained by the intake of certain healthy foods in our diet like bitter guard daily. Teaching the child about healthy eating habits and to avoid junk food, oily food and food with extra fats. Scheduling health check-up and visits to the doctor regularly. It was only a few decades back that type 2 diabetes was considered an adult disease and childhood diabetes was only known to be type 1 diabetes. However, things have changed over time. Today children are also affected with type 2 diabetes. To know more about type 2 diabetes, we need to get some basic facts clear. The function of the digestive system is to break down the carbohydrates into a simple sugar called glucose. The function of the pancreas is to create a hormone called insulin. This insulin is responsible for bringing down the glucose from our blood into our cells where it is used to release energy. 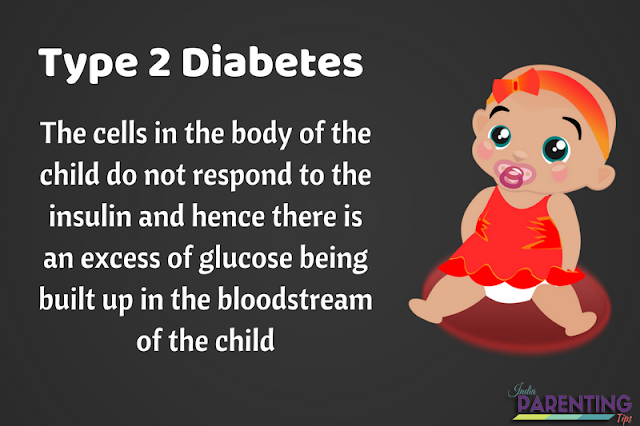 In the case of type 2 diabetes the cells in the body of the child do not respond to the insulin and hence there is an excess of glucose being built up in the bloodstream of the child. This is also known as insulin resistance. Over the period of time, the sugar level of the child’s body becomes extremely high to handle which could possibly trigger other medical conditions like heart diseases, vision impairments or even it could be kidney failure. African-American, Asian, Latino, Hispanic or American-Indian origin. One major cause of type 2 diabetes is obesity. Child obesity has become a real growing medical condition in today’s fast-paced world. I have written a detailed article on child obesity where I have discussed in detail about its effects, causes and how we can prevent it. Read my articles to know more by clicking on the topics: Childhood Obesity & Stress Eating. Constant feeling of thirst and hunger even after eating. Feeling Itchy all the time. Very slow healing of any cuts or wounds. Numbness in hands or feet. You must take your child immediately to a health care practitioner as soon as you observe any of these symptoms in your child. Once you observe any of the symptoms discussed above it is must to check with a doctor and get your child’s blood sugar tested. Once the blood sugar is tested and it is confirmed that the child has diabetes, there could be some more tests to check which type of diabetes the child is affected with. Once it gets confirmed that the child is affected by type 2 diabetes, the doctor would advise for some lifestyle changes and might also suggest medicines like metformin along with insulin as per the doctor’s analysis depending on the child’s medical condition. Also, it is advisable to get hemoglobin test called A1c tested for the child every 3 months to check the sugar level. Apart from this a proper diet and regular exercise for at least 60 minutes each day are best advised to follow a healthy lifestyle. How can we prevent Type 2 diabetes? The same measures we take to treat type 2 diabetes could be used to prevent it. To be clear, it means that regular exercise, health check-up, eating a balanced diet with less fat and oily food reducing the extra calories are the best ways to prevent type 2 diabetes. Please feel free to check out my articles on emotional eating and childhood details for more details on certain childhood issues to know how we can handle them in the right manner by taking corrective actions. To conclude, if your child is affected by diabetes be it type 1 or type 2, the first thing is to accept the issue and then move on positively taking appropriate actions. Ensure that you talk to your child about the issue and be supportive so that the child can open up and talk to you about his or her concerns. Do not make drastic changes but move it slowly. When you make changes in lifestyle and diets make sure the entire family accepts it without alienating the child. Above all, it is good to eat healthy food and do regular exercise. Cut down television and time with tablets and iPad. Ensure more physical activities that the child enjoys depending on his or her interest. Do not have over expectations from your child to accept all the changes easily. Above he or she is only a child. It is a good idea to set small goals and cherish the milestones crossed. When you work together as a team, as a family along with the doctor you are sure to win all odds.